Any serious gamer who was watching the Discovery Channel's "Dual Survival" show earlier this week may have recognized the logo that appeared on a box of bullets that were briefly featured in the episode. The box had the words "Halo-Point" on it, written in the font used for Halo, the phenomenally popular M-rated Xbox and Xbox 360 first-person shooter. When gamer Christopher Phillips saw the show and the bullets, he was stunned. "I am writing this whilst experiencing intense anger and frustration that this appears to be an official Halo product, and that one of my favorite video game franchises appears to be promoting ammunition sales!" he said to me in an e-mail. Later, he added, "I hope from the bottom of my heart this is not an officially sanctioned product." The bullets are real, but they're not officially tied into the game. In fact, Microsoft seems mighty upset about them. As of this writing, Halo-Point bullets may no longer exist. The company that makes—or, perhaps, made—Halo-Point bullets is called Liberty Ammunition. It's a small Florida-based company. 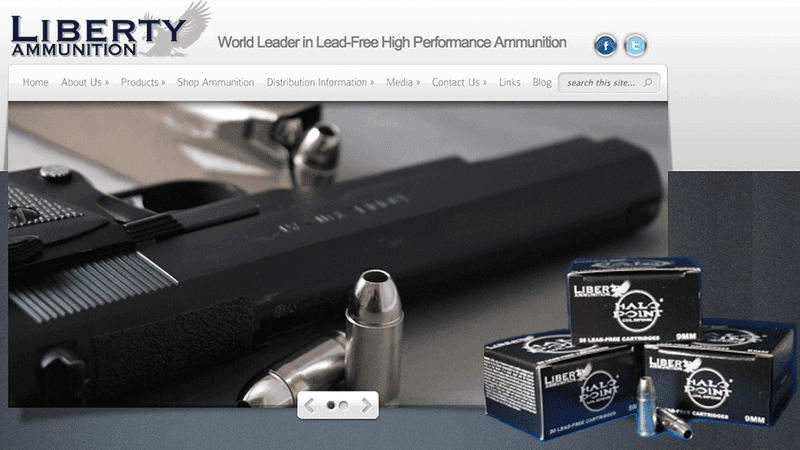 On the Liberty website, the company bills itself as the "world leader in lead-free high performance ammunition." Liberty keeps a low profile. The first question in the Liberty Ammunition online FAQ is "Why have I never heard of your company?" The answer: "Liberty has historically only provided ammunition for the US Military. The Company's mission is to protect the lives of our troops, allies and law enforcement officer's around the world by providing them the highest performing ammunition in the world. As such, it has never needed to nor has it generated any awareness in the commercial market. Liberty also does not engage in "Marketing." The company operates on word of mouth and performance. Without exception, every US Military, Law Enforcement, or Foreign Allied Military professional that has seen Liberty Ammunition's performance has validated its efficacy and uniqueness." If Liberty's Halo-logoed bullets hadn't appeared in a Discovery Channel show, you may still not have heard of them. But logos are made to be recognizable, and so here we are. For the past few days, Kotaku has been trying to determine just what the story with these bullets is. Company president George Phillips and other representatives have not replied to multiple requests for comment, but the Internet turns out to be well-stocked with information about the Halo-Point bullet. Here's a video from 2011 of 9 mm and .45 caliber Halo-Point bullets piercing a body armor with fatal force. The bullets are labeled as being "for military application" only. There's no sign of a Halo logo in this clip. Here is an image of Halo Point-Civil Defense bullets—ostensibly the ones deemed ok for non-military use—published by Liberty Ammunition. 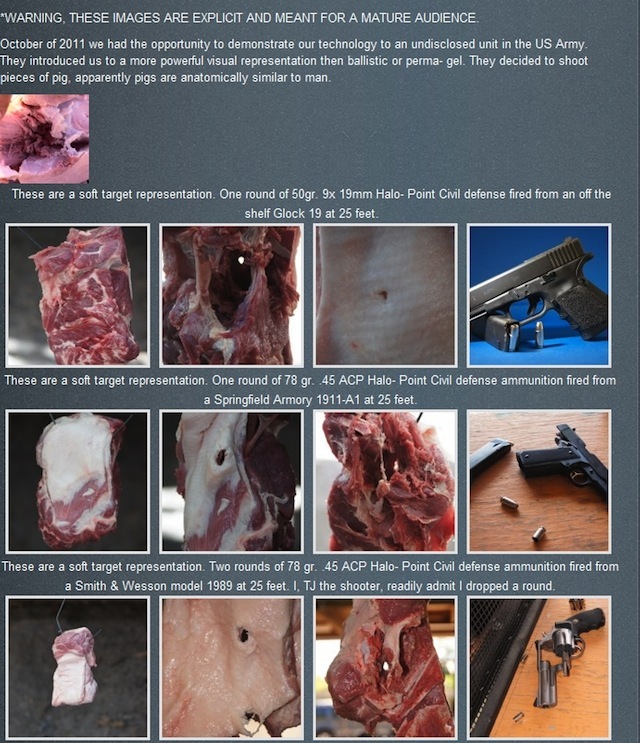 The picture shows the results of the bullets being shot into parts of a pig carcass to demonstrate the potency of the bullets. I found the image on the website defensivecarry.com. Some DefensiveCarry readers were skeptical that the bullets could do all that. Others said they tried them and that they were impressed. 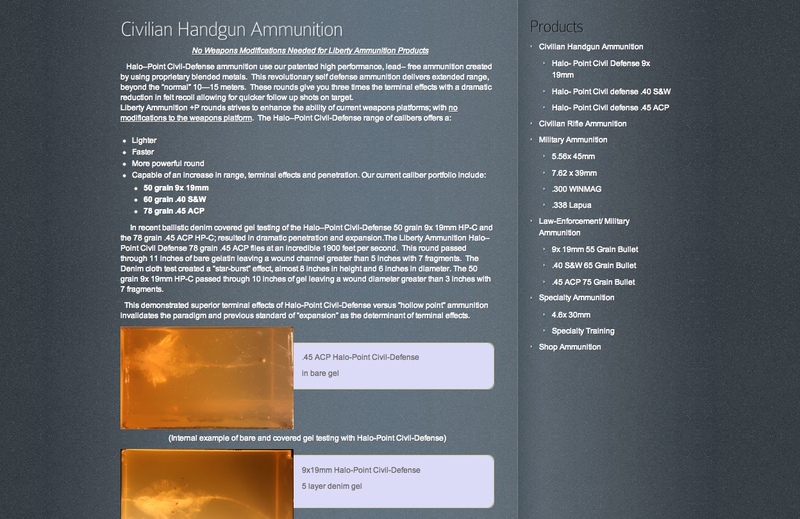 The Liberty Ammunition website had several pages of information about various types of Halo-Point bullets, demonstrating how the bullets perform when shot through gel as well as promoting the lightness of the ammunition, their stopping power and range. This online store listing extolled the bullet's qualities but indicated limited availability. Overall, these bullets are meant to be effective and to impress. It's no wonder that a secretive real-life super-soldier on the Discovery Channel was using them. But it is a wonder how they got the Halo name. "Halo-Point" is a pun on "hollow point", a type of bullet designed to fragmentcompress and spread its force when it penetrates its target. These types of bullets might limit collateral damage, as they're not designed to pass through from one target to the next. Target shooters like them, but they're illegal in New Jersey. If you wanted to make a pun on "hollow point", switching to "Halo" certainly works. It's a more clever pun, of course, if you've heard of the game and if you can therefore associate the potency of a real Halo Point bullet with the amazing, alien-killing ammunition fired by Master Chief in the Halo video game series. There is, however, no sign that Halo publisher Microsoft ever worked with Liberty Ammunition on these bullets. A representative for the Xbox maker told me that Microsoft discovered the existence of the Halo-Point bullets late last year and was in touch with Liberty from September through December. "We took issue with the clear attempt to invoke the Halo brand without authorization," the rep said, indicating that the matter involved the Halo logo and the word. It's not beyond the realm of possibility that a video game maker would want to be associated with real guns or bullets. Or at least it wasn't back in the summer, when the game publisher EA (Battlefield, FIFA, The Sims) awkwardly linked the website for its Medal of Honor first-person shooter to the websites of several weapons manufacturers. But, after criticism of the linking of games to guns, EA backed off. Last month, the massacre at Sandy Hook Elementary school prompted new scrutiny about the link between games, guns and violence, resulting in a call in the U.S. Senate for more research on the effects of violent video games on their players as well as a front-page Christmas-day story in the New York Times that re-addressed the EA incident. These days, the last thing that video game creators seem to want is to be linked to real violence and the gun industry. "Microsoft does not have a licensing agreement with Liberty Ammunition, or any gun or weapons manufacturer, and the company does not have permission to use "Halo" branding on any of its products," the Microsoft representative told me. "When we discovered the unauthorized use last fall, Microsoft contacted Liberty Ammunition to demand removal of all "Halo" branding from its products and advertising, to which Liberty Ammunition agreed. Microsoft is following up again to ensure full compliance." I received that statement last night, a few hours after I had asked Microsoft to comment. While Liberty Ammo representatives have yet to respond to me, they've clearly responded to Microsoft. They've removed imagery from their website and re-branded their signature bullets. Halo-Point bullets are now referred to throughout Liberty's website as "Liberty Ammunition Civil Defense." The Halo logo is all but gone from the Liberty site. The box of bullets that appeared on the Discovery Channel didn't just have a Halo logo on them. They had a trademark. That too appears to be out of date. While Liberty's trademark attorney has not responded to multiple requests for comment, government filings indicate that Liberty's year-long efforts to trademark Halo point ammo were recently winding down. The trademark for Halo-Point bullets is now listed as "dead." The Halo-Point trademark was surrendered, by Liberty themselves, on November 7, 2012. That's one day after Microsoft released its most recent Halo-branded product. Microsoft's use of Master Chief's brand was official. It's called Halo 4. You may have seen that on TV, too.